Glazed baby carrots have always been a Holiday staple in the South. Traditionally they’re made with tons of butter and brown sugar, forming a brown, syrupy glaze. And sometimes they’re made with butter and maple syrup. 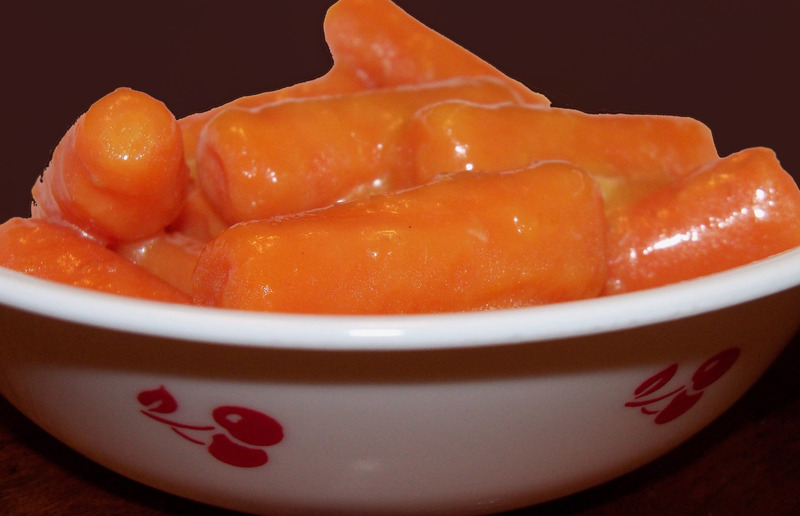 My version of glazed carrots – Citrus Ginger Glazed Carrots – is lower-fat and lower-sugar than most. Orange juice gives it a bit of a tang, and ginger gives it a bit of a kick. If, like me, you’re not a huge fan of vegetable side dishes that taste like dessert, you might be pleasantly surprised by this recipe. Place carrots in a small pot with enough water to cover. Bring to a boil and cook until tender but not mushy, about 10 minutes. Transfer carrots temporarily to a bowl. In the empty pot, add orange juice, Earth Balance, sugar, salt, and ginger and heat over medium heat until Earth Balance melts. Add cornstarch and stir well to eliminate any lumps. Keep stirring the mixture frequently until it starts to thicken and forms a glaze. It will look a bit like cake frosting, instead of the more syrupy glaze you may be used to seeing on glazed carrots. Add the carrots back into the pot and toss gently to coat. If possible, I always use real baby carrots instead of the regular carrots that have been “shaped” to look like baby carrots. To me, they just taste better. I like using baby carrots not only because of the taste, but because of the minimum prep time involved. (No peeling, no slicing!) 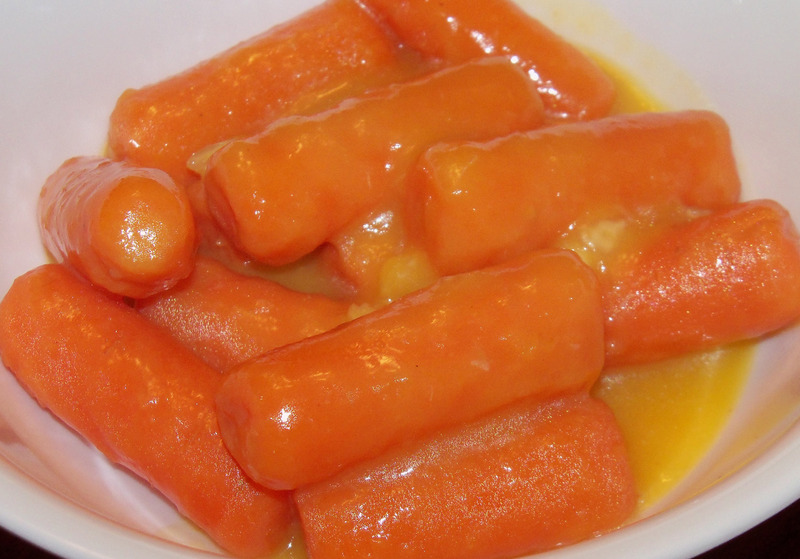 You could always use regular carrots in this recipe, sliced into coins. Fresh ginger versus powdered? In this recipe, both have their advantages. Fresh ginger certainly gives the carrots a lively, “zippy” taste. (If you like zippy, you can even increase the fresh ginger up to two teaspoons.) But the powdered ginger makes a very smooth, pretty glaze. In the picture at the top of the page, you can see a few “lumps” from ginger I hadn’t minced finely enough. The carrots look like jewels! Carrots are my least favorite vegetables and I’m always looking for ways to enjoy them! Thanks! Actually, my favorite camera is broken and I’ve had to take pictures with point and shoots, cell phones … I really despaired of getting even a halfway decent shot! Personally, I have found adding ginger goes a long way to helping me like my less favorite veggies!